Adding to a Loser - What Does It Mean? What does the term "adding to a loser" mean in the world of trading or investing? What is meant by the term "adding to a loser"? 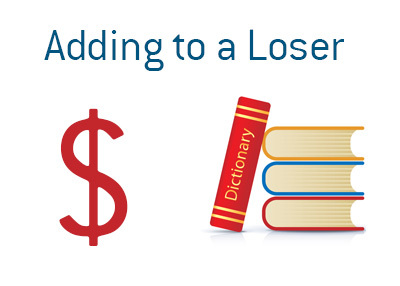 In trading or investing, "adding to a loser" refers to when you add to a position that is going in the opposite direction of what you intended. For instance - let's say that you buy 1,000 shares of MSFT at $40. After a weak earnings report, MSFT trades down to $35/share. You decide that this is a great price to add more shares at, so you elect to buy another 1,000 shares of the company at $35. This puts your average price for your 2,000 shares at $37.50. In this case, you would have "added to a loser", as MSFT was down $5 per share from your original entry point. Adding to a loser can be very dangerous if you don't have a thorough knowledge of the company that you are purchasing shares in. It is easy to end up getting "married" to a stock if you find yourself owning too many shares.